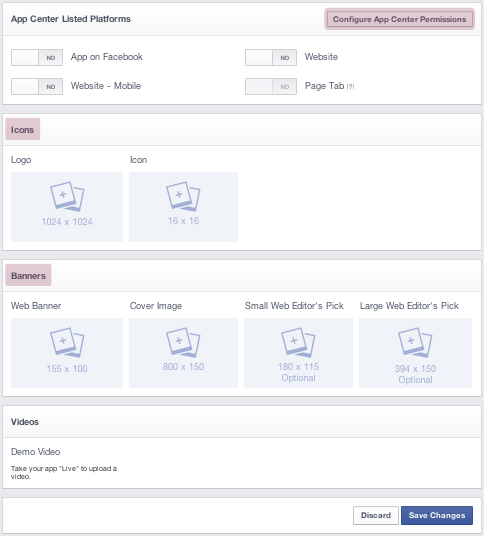 This tutorial will show you how to publish a campaign, sweepstakes or tab with Facebook content in the White Label mode. That is, you will publish what you have setup using our platform in a new app that you’ll create following the steps below. This app won’t feature any reference to Cool Tabs and it will give you certain advantages compared to standard publishing. 1. Access the Cool Tabs dashboard and click on the ‘Publish’ icon of the campaign or content that you want to launch and that you have previously setup. 3. Choose how you want to publish your new content or campaign. You have two options: Standard or custom mode. 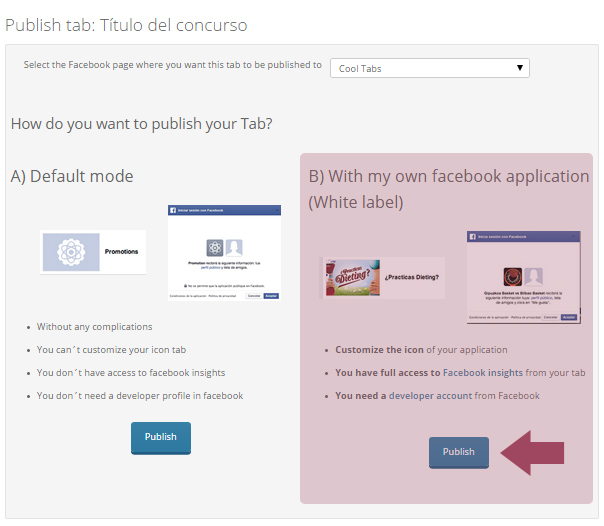 In this example, we’ll choose the custom mode, since we want to publish using the White Label. 4. 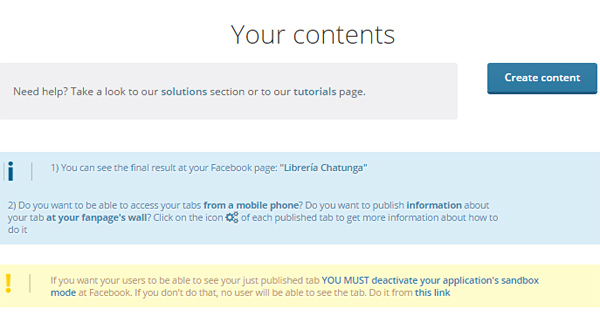 Clicking on the ‘Publish’ button will take you to a page where you’ll be prompted to choose the ‘Facebook app where you want to install the tab’. 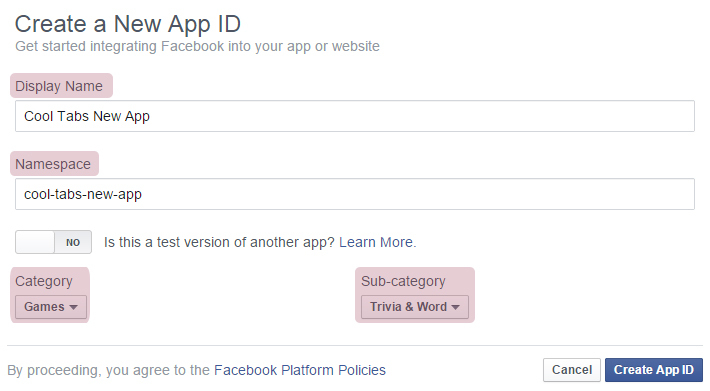 So we go to Facebook Developers and create a new app for the new content or sweepstakes that we want to activate. ** ATTENTION: We will limit ourselves to follow the steps in this tutorial. Click on ‘Apps’ in the menu above and choose ‘Add a new app’ in the scroll down menu. You must select the platform where you wish to create it, in this case: ‘Facebook Canvas’. In the next screen, you’ll see an option on the right that says ‘Skip and Create App ID’. Click on that option and you will go back to the regular and most simple steps to create an app. 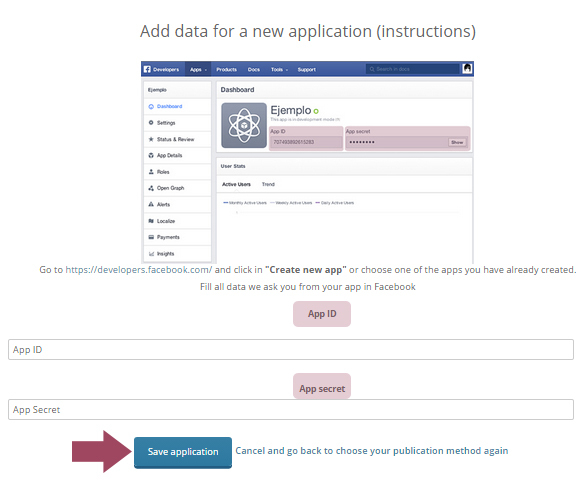 Then you’ll see a pop-up menu where you must enter the name of the app (call it whatever you want, but think that the name will be visible for users, so pick something connected to your campaign), the namespace (the name that will show in your app’s URL separated by hyphens: https://apps.facebook.com/aqui-namespace/ and, if you don’t write anything, we’ll change it automatically) and the category and subcategory of this new app, where you must select the ‘Games’ and ‘Trivia & Word‘, because with other categories the option “Invite friends” is disabled. Once the 3 fields above have been completed, you need to click on ‘Create App’, enter the captcha, and you’ll have created your app. Now, you just have to tell us the ‘App ID’ and the ‘App Secret’ so that we find your newly created app. For security reasons, the ‘App Secret’ is not displayed, so you’ll have to click on ‘Show‘and enter your password to be able to copy it. 5. Paste the App Id and the App Secret in Cool Tabs in the page where you were asked about the Facebook app where you wanted to install the tab, and click on ‘Save App’. 6. Once our platform recognizes the saved app, it will appear as an available application that you can use to publish your content or campaign, so you just have to click on ‘Publish’. 8. In order to disable the sandbox mode, we go to the app that we created in Facebook Developers and within the app menu we click on ‘Settings’ and enter the contact email, which is a requirement to disable the sandbox mode. We then click on ‘Status & Review’. There, we will be told that if we want the app to be visible to everyone, we must click on the ‘Yes’ button. ‘No’ is set by default. To finish setting the tab, go to your campaigns, click on the information icon. Go to the 'advanced settings section on Facebook', click on 'Instructions' and follow the steps you will see. The app with your content has already been published! What other features in my app can be setup from Facebook Developers? In ‘App Details’ you can set the permits for the ‘App Center’. But the most important thing is that you can add your app’s banners and icons, so that when your participants invite their friends to the app or share it, there is a reference image. This is one of the most important aspects that you must complete for an app with content or a campaign for your Fan Page. 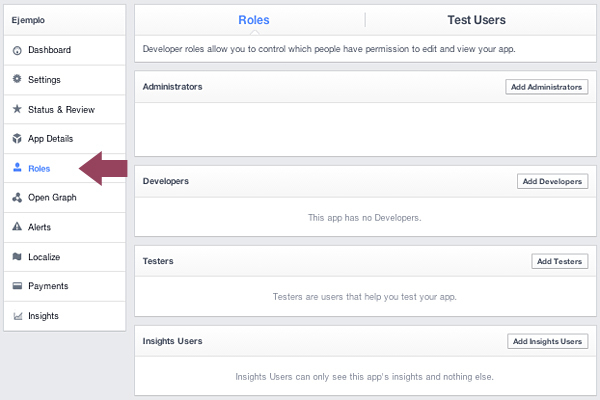 In ‘Roles‘ you can assign your colleagues roles so that they can edit or see the app. 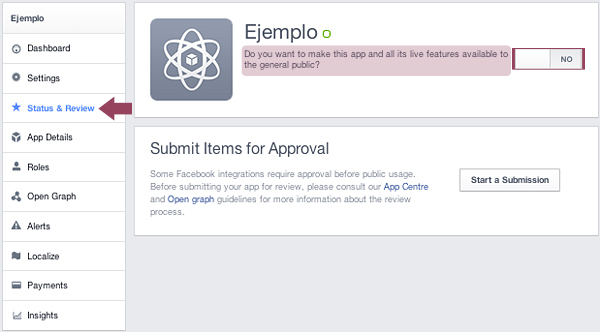 You have access to Open Graph, where you can measure and set the interactions with your app. 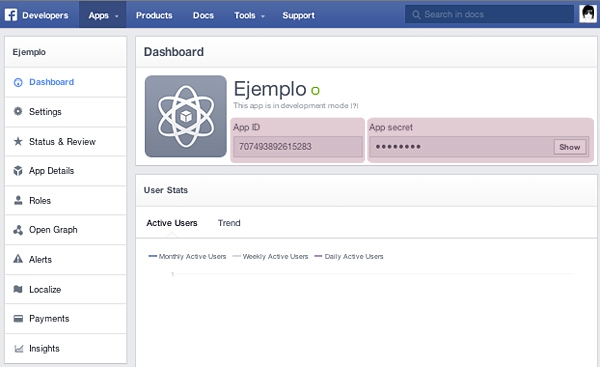 You can access the statistics of your app or Facebook Insights. These are the most important actions that you can do in connection with your app using Facebook Developers. However, there are many more options, although they’re usually not applied to this type of app. For example, setting the payments of a paid app, have the app localized in different languages, include alerts, etc. To sum up, by following the publication steps above and by making the app visible, including the icons and banners that represent it, you will get a highly professional outcome with a series of advantages for choosing the White Label option. We hope that you make the most of your new app!